Last year, we made some awesome treats for the Holidays. It was such a hit (both the making and the eating) that we decided for another iteration this year…with a few adjustments. For instance, we had the wonderful assistance of our friend Amanda and our children being just that much older were able to enjoy things just that much more. We ended up making marshmallow fluff (for use in the chocolate fudge), marshmallows, spicy and candied almonds, coconut bon bons and peanut brittle. We left out the ribbon candy (a simple hard candy) and chocolate covered cherries. We started with the marshmallow fluff (or creme), which we’d need for the chocolate fudge–rather than using store-bought fluff. 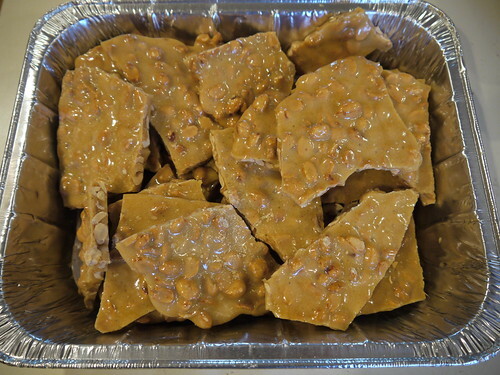 We made a double batch, which turned out to be not quite twice the amount we’d need for our quadruple batch of fudge (see below). 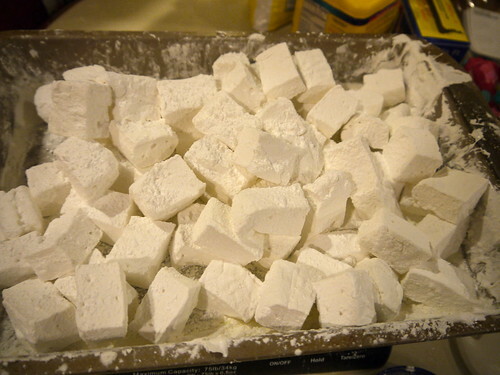 Fluff is a lot easier to make than traditional marshmallows because you don’t need to cook anything and it doesn’t take any gelatin. The basic recipe consists of egg whites, corn syrup, a bit of salt and powdered sugar. 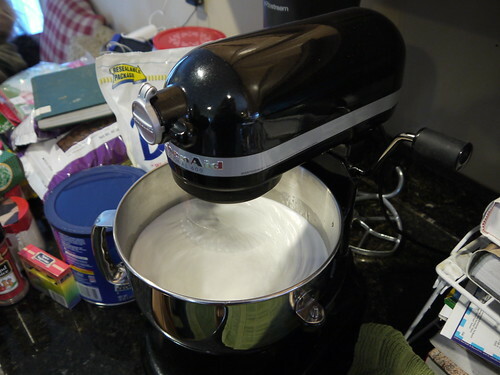 Here’s the marshmallow fluff recipe we used, same as last year. We used Alton Brown’s marshmallow recipe. It’s the best we’ve found. 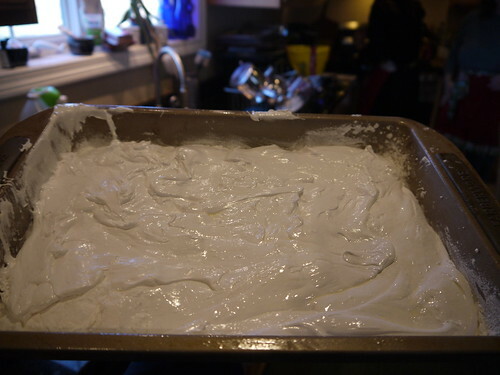 The main reason we made the marshmallow fluff was to use in the fudge. 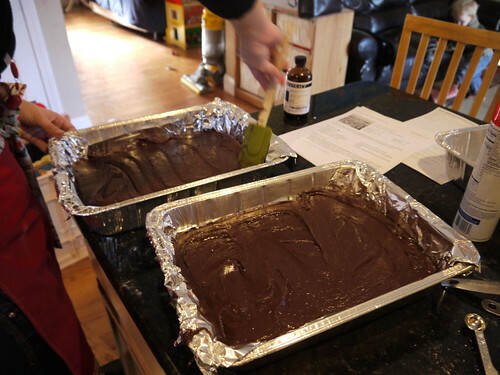 We ended up quadrupling the fudge recipe, but even that didn’t use all of the fluff we made. Oh, well, now we’ve got two jars of fluff in the fridge for fluffernutters. The quadruple batch was pushing the limits of our pots and pans. 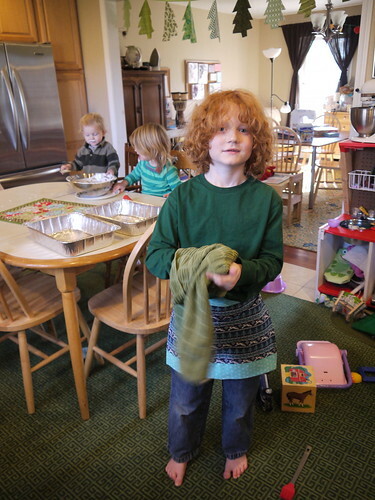 Luckily it all fit and the batch turned out to be the best we’ve ever made. 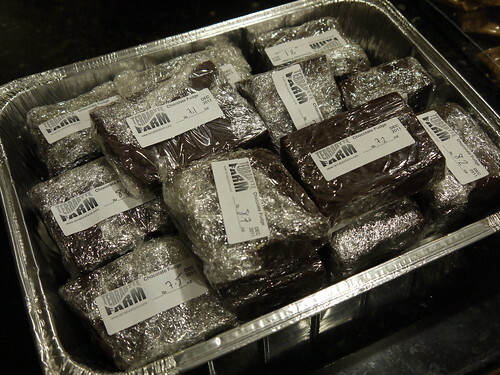 It was close to 10 pounds of finished fudge. 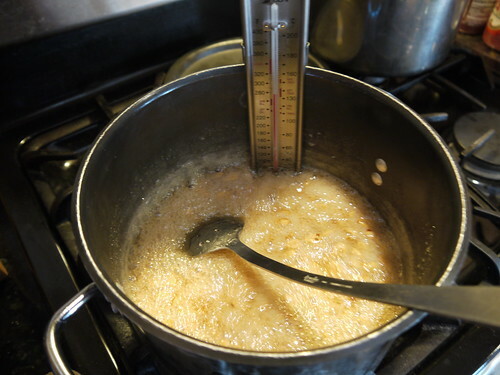 We used the same recipe for fudge as we did last year, a pretty straightforward cooked budget which has given us excellent results. 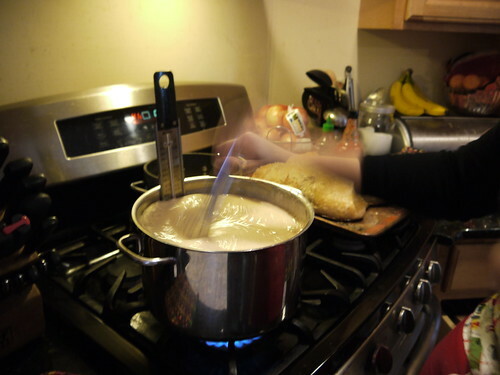 Marshmallows are only a little more difficult than fluff, in that you have to “cook” the syrup first and it also includes gelatin to make the finished product firmer. We plan to use these as yummy additions to our Holiday hot chocolates. 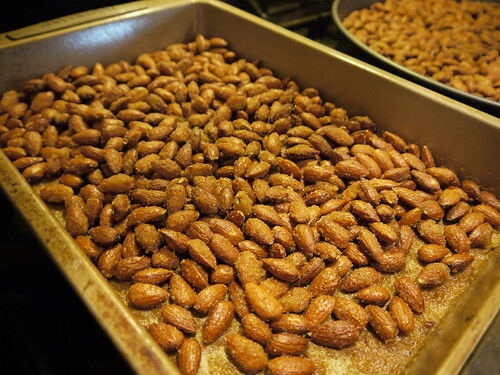 Last year our spiced and candied almonds were very popular. We decided to go larger this year with double batches of each. 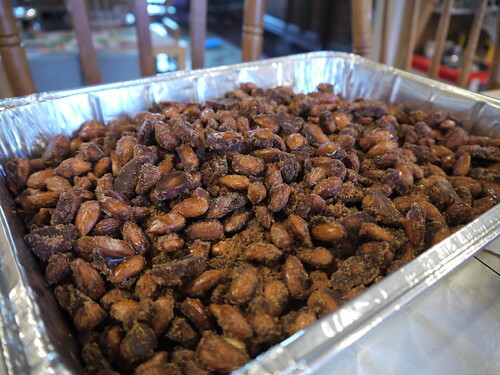 Here are the recipes for the spicy almonds and candied almonds, same as last year. My mom loves coconut and these treats are delicious. 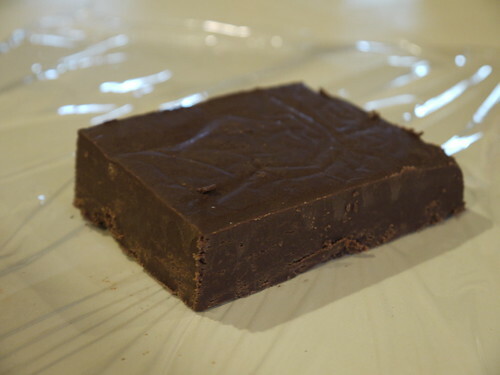 Think of it as a Mounds bar, but homemade and without the sodium metabisulfite. Granted, ours probably aren’t as shelf stable as the Peter Paul/Hershey product. 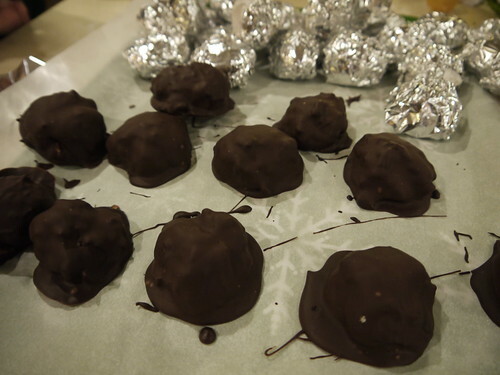 Here is the recipe for the coconut bon bons. We do have to say that we think we’ll make some revisions to the recipe in the future: perhaps the addition of coconut extract for extra flavor. They tend to taste “sweet” and not as coconut-y as we’d like. 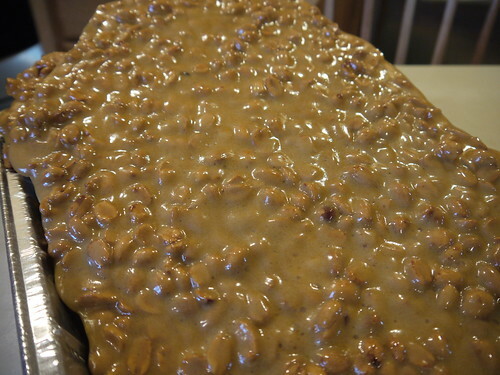 If it could be said that we have a tradition, it would be our brittle. We’ve been making it, with little variation, for many years. We use a lovely recipe of uncertain provenance that has turned out gorgeous results in our Calphalon stock pot time after time. 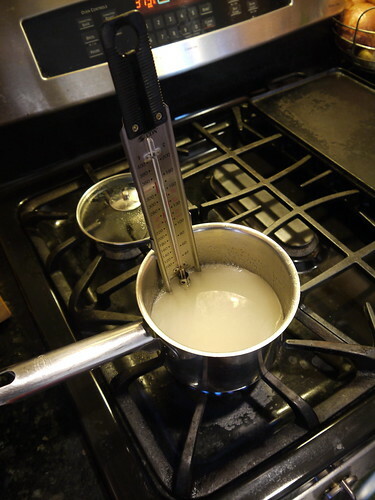 We use an anodized aluminum Calphalon stock pot to make brittle, which distributes the heat evenly and quickly. 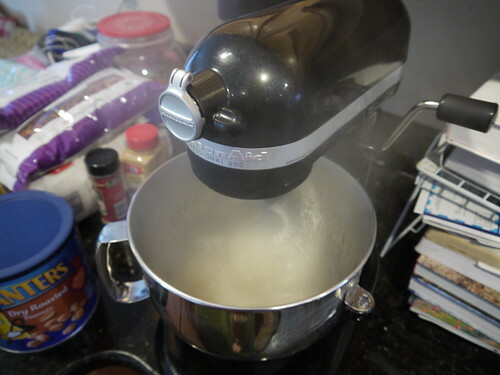 Note: the Calphalon is also excellent for making fresh, hot popcorn.